In April 1999 a co-worker and I decided to walk in our first Race for the Cure, we did the 1 mile walk and vowed to get in better shape so we could walk in the 5K the next year. The following June I went for my annual mammogram as I had done since I was 40 years old. I got a call to come back a few days after the initial mammogram, the radiologist wanted more films they said. I went in and after some magnified shots and an ultrasound the radiologist came in and did a breast exam and said he wanted me to have a biopsy. He reassured me that this didn’t mean I had cancer and although the ultrasound scared me I accepted his reassurances. My PCP referred me to a surgeon who would do the biopsy. Ten days later I had a needle guided surgical biopsy which gave me the diagnosis of breast cancer. For some reason I was not afraid, nor was I mad, I just accepted it and thought well we’ll just take care of this and I’ll be back to life as it was before. I felt like this whole thing was very surreal, as I walked around the grocery store I thought these women are not like me, they don’t have something growing in their breast. My husband and I met with the surgeon and he explained what kind of breast cancer I had. It was estrogen and progesterone positive that meant it was fed by the hormones in my body and he said the prognostic factors were very good. He suggested several surgical options and said he’d send me on to a plastic surgeon to find out what my options in reconstruction were. The plastic surgeon also gave me several options, although the exam at his office was very revealing to say the least! He also had a nurse who was a breast cancer survivor and she showed me videos and had dolls that displayed the different procedures. I think she was called a navigator. At this time my husband got on the internet and did some research for me. I decided to do my own research because I knew what questions I had. 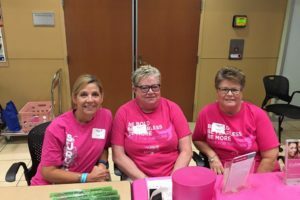 Even though I was a nurse I knew nothing about breast cancer!I tried the Susan G Komen website and learned a lot about reconstruction and I went to the patient section where women asked and answered one another’s questions. I found this invaluable as I could ask the questions I personally had and women who had been there answered the questions from their experience. I wanted to know what women who did a lumpectomy versus a mastectomy felt like. Did the ones who did a lumpectomy feel afraid the cancer was still in their breast? I was really struggling with that thought. Thanks to the input of other women I decided my first choice of a mastectomy with immediate reconstruction was the best option for me. On July 14th 1999 I had my skin sparing mastectomy with immediate tram flap reconstruction; it took 6 hours to do the surgery! Things went well post operatively in the hospital and I was able to go home on the 4th post op day. I had no lymph node involvement so I did not have to do chemotherapy just hormonal therapy, Tamoxifen. Things went pretty good and after 10 weeks I went back to work. I continued to go to the Susan G Komen website for information and the support of other women. I even made friends with a woman who lived close to me. 5 months after my surgery I developed a high fever and chills, and was told it was the flu. I got over that but it happened again and I noticed I began to accumulate fluid in my abdomen. On the third onset of the chills and fever and being unable to drink even water and being told I had the “flu” again my son insisted I go to the ER and when I arrived there I still had a high fever and was given a CT scan of my abdomen which revealed I had a massive amount of fluid in my abdomen and behind my right reconstructed breast. I was transported to the downtown hospital by ambulance. My plastic surgeon met me there and did a paracentesis to drain some of the fluid from my abdomen. What a relief! I spent 8 days in the hospital having every test known to mankind it seemed! One of the tests revealed ovarian cysts and tremendous endometrial thickening a side effect of the Tamoxifen. The doctors had a drain inserted in my abdomen to drain the remaining fluid, my temperature began to go back to normal and my hemoglobin began to slowly rise. I was very weak but the day before Christmas Eve I was allowed to go home. No one ever found out what was wrong with me but they got me well and that’s all I cared about! My husband had brought me a CD player and some CDs he knew I’d like and to this day that music takes me back to that awful time in my life. I was ordered to see my GYN doctor because of the ovarian cysts and endometrial thickening. She advised me what to do if I had any bleeding, an endometrial biopsy would have to be done. A total hysterectomy was another suggestion but I didn’t want any more surgery or time in the hospital and she went along with that. After that it seemed I had an endometrial biopsy every month and they were all thankfully benign. I also began to attend a breast cancer patient support group which I fund very helpful and I made a lot of new friends there. In April 2000 I had my stage 2 reconstruction and all went well. On April 8th I formed a team from work and we walked the 5K in my first Race for the Cure! What an amazing experience, I think I cried the whole day, I was so overwhelmed by the support and the way everyone celebrated us, the survivors! I will never forget that first walk as a survivor and I thought of the year before when I had walked the 1 mile Race and being diagnosed in the next two months meant I was really survivor all along! The next day April 9th was my 51st birthday and my husband made it a special day, During the night I was awakened by chills and fever again. My temperature was very high and after a day or two like that I went to see the Infectious Diseases doctor who had taken care of me during the time with the fluid in my abdomen. He admitted me to the hospital and after a CT scan revealed some fluid under my left breast he had a drain inserted, the fluid grew strep and a PICC line was inserted. After a few days I was allowed to go home with the PICC line in my arm so I could receive continuous antibiotic. By this time, I had lost a tremendous amount of weight due to the illnesses I’d endured. While I was off work I began walking and walking and eventually I added a little running too. In a few days I was able to go back to work with my drain and my PICC line in place!! I worked in a school and the children were fascinated by my tubes and they were quite concerned about me! Eventually I got both tubes removed and I took oral antibiotics for several weeks. Before I knew it my first survivor anniversary came along, on the 14th of July. I enjoyed celebrating but then another demon appeared in my life, depression. I’d never had depression in my life and I tried to ‘fix’ myself which didn’t work. I thought ‘Oh Great! First my body let me down and now my mind is letting me down too ’ I wanted to go back to having a ‘normal life’ but I found I didn’t know how and I was afraid I would have to have a hysterectomy and I didn’t want any more surgery where something went wrong. I went to a counselor at the urging of my son and husband and she confirmed I had depression and PTSD and that I had the right to be depressed! What a revelation! My husband was my most wonderful support partner through this time. He made me laugh but he never laughed at me. After several sessions and the addition of an antidepressant I began to heal emotionally and this insight was something that would help me serve other survivors later on. Next came my second Race for the Cure and I decided to form a team from work and I ran the Race! I was so excited that I was able to do this and again I was amazed at the support of everyone and the recognition and celebration of survivors! It was still a very emotional day for me and this time I found I knew a lot of the other survivors and we were able to celebrate together. I felt so special thanks to those who organized the Race. Now I was able to get involved in other survivor events and make even more friends. I learned so much from those events and from staying on the Susan G Komen website and the support group facilitator. I found my yearning for information about breast cancer was never ending! I found other women would ask me for information and advice and I also learned about resources in the community. In November of that year I had a total hysterectomy and this time everything went well with no post op complications! Also the ovarian cysts were benign and so all I had to do was get well which I did easily. I continued to run and participated in several other Race for the Cure events in Dallas, Austin and New Mexico. I loved doing these and being honored and celebrated as a survivor at these Races too. I think I learned something new at every Race! I also did a 3-Day walk and raised $10,000 for the cause. I then began to participate in Sprint triathlons. I wasn’t good or fast but I finished and had fun! Then I helped form a team of women cancer survivors to do triathlons, we had a blast and strengthened the bonds of survivor sisterhood. I continued to help other women and became very active in the support group. When I asked the other ladies if anyone had suffered from depression and the flood gates opened! So we were able to share and really open up to one another and not pretend everything was just fine. In 2004 a speaker came to our support group, she was Dr Robyn Young an oncologist who specialized in breast cancer. The group was well attended and that night many of us decided to switch oncologists and have Dr Young take care of them including me! In a year or two I was told Dr Young was looking for a Patient Navigator. I didn’t think too much about it until someone including Dr Young urged me to apply for the job. 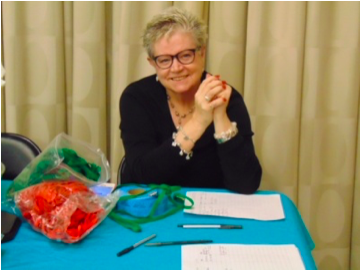 It was a big step for me because I’d worked at the school for 15 ½ years and I did love the staff and students but my heart was in helping other women who were facing breast cancer. I was offered the job and I accepted it. I was learning from Dr Young and she was a great and a patient teacher. I created my own new patient information packets and I would see the new patients before Dr Young and give them an idea what to expect when they saw her and about the Center for Cancer and Blood Disorders where I now worked. I was able to share my experience with patients that it was OK to have depression and other emotional problems. I learned that when I was diagnosed I had several risk factors, being overweight, not eating a healthy diet and not exercising. I also started a support group for women with metastatic breast cancer because these women didn’t have any such group. I would also organize other programs for all the cancer patients using the support staff at the Center. We had A Day of Beauty and participated in the American Society’s program ‘Look Good Feel Better’. As time went on I decided we needed a Resource Room where patients could get information about their cancer (not just breast cancer). Women could also get wigs, hats, scarves and turbans and information about other services in the Center and in the community. I asked and was given permission to start a team for the Race for the Cure. I did this for several years and we won the award for the largest medical team. Our team was composed of patients, staff and doctors and their families. It was again a day of celebration! I was involved in the Race for the Cure in a different capacity when I agreed to serve as volunteer chair in the April 2005. I did some volunteer work whenever I could until I retired in 2010. 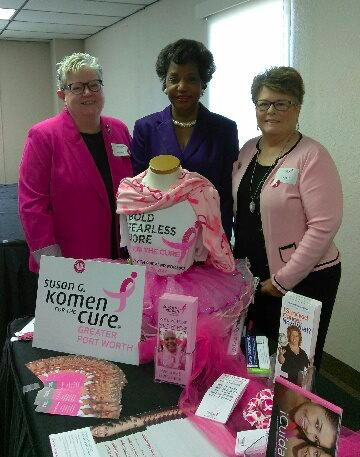 Then I was really able to get involved with Susan G Komen Greater Fort Worth. 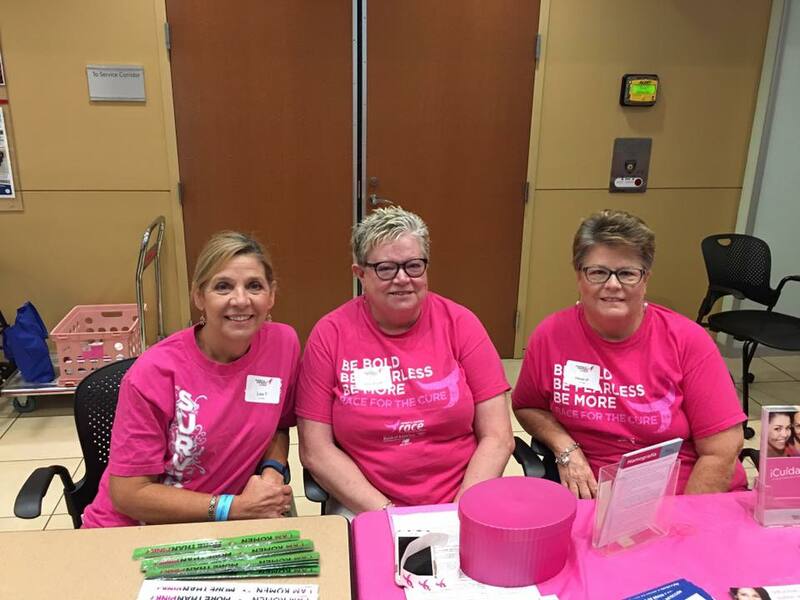 I particularly enjoy health fairs because I have the opportunity to educate women and men about breast cancer, the risk factors, and how ethnicity affects a breast cancer diagnosis. I also get to share what Susan G Komen Greater Fort Worth does, who it’s grantees are in the community and how it serves uninsured women. I have found that there can never be enough education about breast cancer. One more event I am involved with is getting survivors who will ride in the Komen wagon which participates in the Fort Worth Stock Show parade every January. It is one of the most fun events in which I am privileged to participate and I have been doing it for about 5 years now. 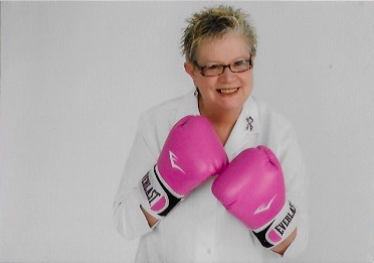 This July I will be a nineteen year survivor, and I started with Komen and all these years I have continued with Komen for support and education.